A firm favourite among youngsters for generations, toy tractors are the ultimate source of outdoor fun. What could be better than driving yourself around, as well as being able to shovel up sand or wood chippings, all with your very own tractor? Just like toy lawn mowers, toy tractors are a great introduction to the skills and dicipline required to to operate real tools and complete tasks effectively. Even in today’s IT based world, the same mindset needed to solve practical problems applies to solving problems in a virtual environment, so it’s all good stuff! What better place to start than with the undisputed masters of the tractor, John Deere. 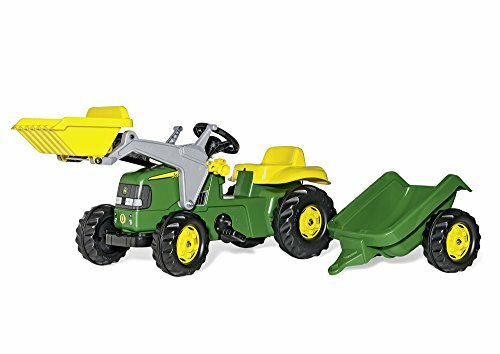 This deluxe tractor, officially licenced by John Deere themselves, comes complete with a fully working loading bucket, opening bonnet (so that your little one can inspect the engine), and a removable trailer should they wish to transport some of their other toys around the garden. Made from durable plastic, with sturdy non slip pedals, this tractor can be riden around with all the unforgiving rigour only a child knows how to deliver, and still escape in one piece. Able to survive crashing into walls, fences and flower pots (even if the flower pots don’t fair so well) this tractor will provide reliable amusement for as long as your child wishes to use it. There really are hours of fun to be had with the tractor, why not set up a designated spot in your garden with material that your son or daughter can pick up and move around? We recommend wood chippings as they’re less messy than sand and can be easily cleared up at the end of a busy days digging. From your point of view as the lacky who has to put the tractor together, you should bare in mind that there is a little bit of assembly required. You’ll need a few basic tools, such as screw drivers and an adjustable spanner, but you shouldn’t have too many issues as long as you follow the instructions and take care over it. We’d recommend allowing at least an hour and a half to assemble correctly. 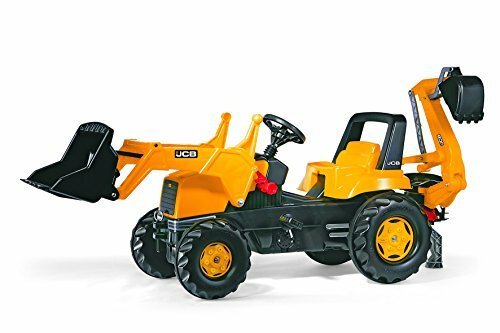 We’re really in business now, it’s the turn of JCB to make their mark on the toy tractor market, and they’ve done so in style with this. 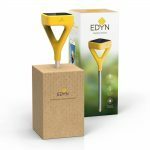 This once again fully licenced product features both a front loading bucket and a rear excavator, and budding little builders will have an absolute blast at the controls shifting around material in the garden. With the pretend hydraulic jacking foot in place your little one can sit themselves on the second seat to control the rear excavator, which really makes it like two toys in one. If you’ve ever seen the diggers sometimes found in parks and farms where children can shift around dirt or sand you’ll know just how fun they can be. Well the great thing with this is that you get that included, and just like a real digger it can be retracted and tucked away when the digger is being driven along. This tractor really looks the business, complete in JCB orange livery, and once again made from a sturdy knock and bump proof plastic. This digger/tractor even comes with both front and rear hitch pins, so it can be used in conjunction with other trailers, or have a front towing line attached so that you can get involved in the fun by pulling the tractor around the garden whilst your little one enjoys the ride. It must be said that this is a little on the pricey side for a toy tractor, but if you’ve got more than one child who will be able to enjoy it at different times it certainly makes for a worthwhile investment.